This museum-quality piece by Epic Weapons, DoomHammer, has been recreated by the finest materials and craftsmanship. The release of this high end collectible spares no detail in the real-world realization of the in-game counterpart. With over 30 independent parts and a 3" grip wrapped in genuine, aged leather, this mighty DoomHammer weighs in at 18 pounds! DoomHammer features the G2G authentication chip- which verifies your DoomHammer as 100% authentic! The G2G authentication device is sold separately and NOT included. We have also secured and INCLUDED the DoomHammer Display Base- This base is usually NOT included- but we are making exception! 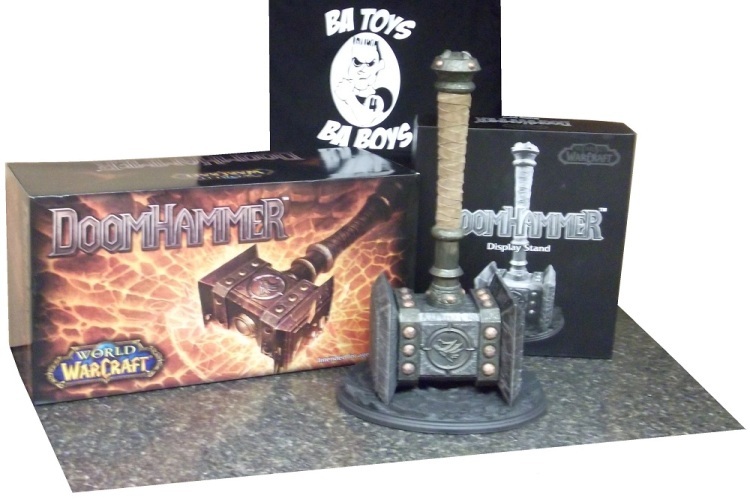 The museum-quality, pre-assembled stand provides easy display of the DoomHammer! The DoomHammer Base is cast in reinforced resin and is finished with layers of stain black paint and a clear, acrylic sealant for durability. This Hand sculpted display mimics the broken terrain of cooled, molten rock! Projected to be as popular as Frostmourne(sold separately) & the Ice Shard(sold separately), this limited edition DoomHammer will have production numbers released at a later date. This World of Warcraft Doomhammer base prop measures about 13 1/2-inches wide x 10 1/2-inches deep.